My oh my. This time last year Democrats were crowing about taking back the Senate. These days it’s looking more and more like Republicans have all the momentum. In Flordia, Arizona, and Nevada, which were all three trending Democrat as recently as early September, Republicans now enjoy strong Senate race leads. If these trends hold, Republicans will enjoy a 54-46 lead over their Senate Democrats come 2019—a huge victory for the Trump White House. The House is also said to be in play for Republicans as well, an outcome seen as highly unlikely just a few weeks earlier. Currently, projections have Democrats holding on to a narrow 206/199 advantage but again, momentum appears to be shifting strongly in favor of the Republican side of the ticket. Congressional polling is less accurate due to there being so many more races to monitor, but a number of internal campaign polls suggest Democrats are getting increasingly concerned Republicans will manage to maintain full control of Congress following the 2018 Midterms. If that happens it would be a strong repudiation of the media-driven narrative that President Trump is unpopular. Historically, the party in power loses seats during the Midterms. Barack Obama was given a strong rebuke by voters in 2010, a result he infamously called a “shellacking” at the time. Should voters side with Republicans in 2018, it would be strong evidence that Mr. Trump is, in fact, a far more popular president than was Mr. Obama at this point in their respective presidencies—something the Establishment Media is unlikely to admit. 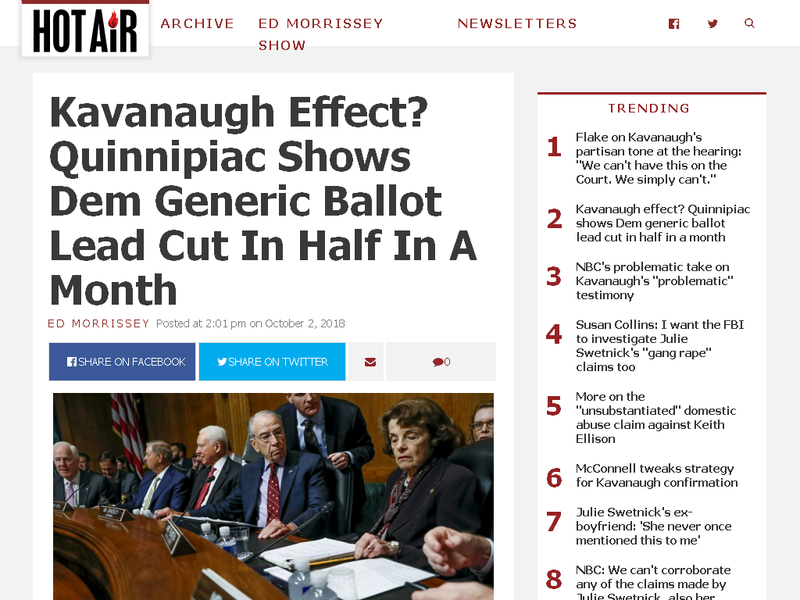 Uh-Oh Democrats – “Kavanaugh Effect” Turning “Blue Wave” Into A “Red Tsunami”? Millions and millions of voters across America were pretty darn happy a few weeks ago. The economy is booming, jobs are plentiful, and new episodes of Ray Donovan were on the way. Then came those crazy Kavanaugh hearings that had little more than unsubstantiated rumors being used by Democrats to pummel a good man’s sterling reputation of service to country and community. Now those same millions of voters are angry and looking to make an example of Democrats in 2018. President Trump remains the single most powerful force in American politics today and last night’s election results further confirmed that fact as Trump-supported candidates racked up wins across the nation despite millions of dollars pouring in to defeat them. Reaction from liberals was predictably negative as they wailed out their frustrations against a lack of Democrat leadership, Green Party candidates, and some even going so far as to suggest the Russians were to blame. The Republicans have now won 8 out of 9 House Seats, yet if you listen to the Fake News Media you would think we are being clobbered. Why can’t they play it straight, so unfair to the Republican Party and in particular, your favorite President!